(MoneyWatch) Despite an economic picture that looks considerably rosier than it has in the past few years, one nagging problem continues to hinder economic growth: Unemployment. For the first time in years, the housing industry may be able to help. While the most recent unemployment surveys for March are weak overall, the housing recovery is responsible for a rare bright spot: Construction job growth, according to Freddie Mac's U.S. Economic and Housing Market Outlook report. Non-farm jobs grew by only 88,000 in March, well below market predictions. Unemployment ticked down this month, but not by much. March's unemployment rate dropped barely .1 percent to 7.6 percent from 7.7 percent in February, and only .6 percent from March a year ago. While that's progress, it's very slow progress. Unemployment numbers are still high compared with pre-recession rates that hovered around 4 percent. And while they are below the more than 10 percent unemployment rate at the height of the recession, a deep dive into the numbers shows that this particular dip in unemployment is not attributable to job growth but to labor force participation dwindling, according to Freddie Mac chief economist Frank Northaft. The good news is that construction, one of the of the hardest-hit industries during the recession, amounts to 15 percent of overall job growth in the past six months. 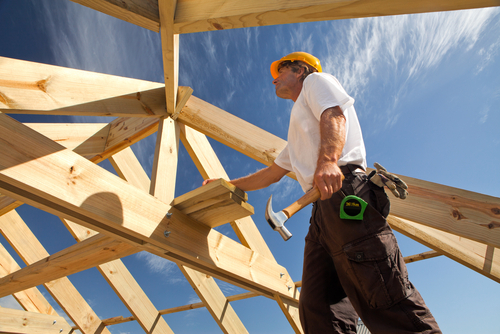 The housing recovery means more builders are starting construction on new housing units. In fact, housing starts were up 47 percent from March 2012, exceeding one million starts at an annualized rate for the first time in five years. The National Association of Home Builders (NAHB) also announced increased builder confidence in the housing and construction market, which almost doubled over the year. However, even with these big gains the index indicates that on average builders are not necessarily optimistic about housing markets -- they are just much less pessimistic. "Housing construction is starting to pick up, but is well below historical averages," Nothaft said. "Supported by low mortgage rates, we expect more homes to be built in 2013 than in any year since 2007. This increased construction employment should continue to help bring down the overall unemployment rate." It's a careful balance for now, but as long as interest rates remain low enough to attract buyers, and housing prices grow enough to attract builders, the construction recovery will continue to grow and help spur overall growth in employment. If the trends continue, this could be the first year in a long time that the housing sector actually helps the economic recovery, rather than hinder it. The housing sector is expected to add a half a percentage point to GDP growth this year, according to the report.